The Van Sciver Chronicles: Stuff.. I'm feeling very crampy today! UGH!! Miscarrying is the worst! This morning I took Alyssa to the dentist. She had a baby tooth that was being stubborn and holding on for dear life! It was barely loose and didn't have much room to wiggle around. 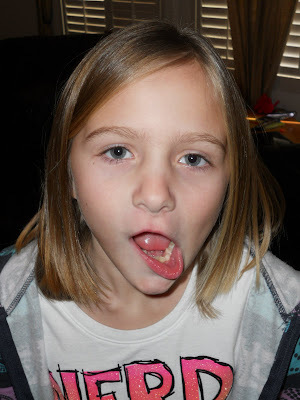 The adult tooth grew in several months ago but way behind her teeth. Since I hadn't taken Alyssa in to the dentist since the end of 2009, I hadn't paid a copay for 2010 and being so close to the end of the year I decided I'd just wait incase she needed any other work done. Now we won't owe a copay for the rest of this year so we'll have to make sure to get any new work done! As it turned out the dentist wanted to pull 2 teeth, to give the adult tooth a chance to move forward. He mentioned braces which I know she will need, but I would rather wait til she's a couple years older. Chances are her teeth will do a lot more shifting over the next few years. Monday morning I took Camden to the doctor for some bumps that he has on the back of his leg. He's had them for a few months but they didn't seem to bother him at first so I didn't worry too much about them. Then last week he started complaining about them hurting so I finally made the appt. Turns out it's Molluscum contagiosum. She didn't prescribe any medications which is fine by me. Time is all it really needs. She recommended using some Cortizone for itching. He was very excited and couldn't wait to leave! It didn't start til 6 but as soon as he walked in the door from school he wanted to put his cub scout shirt on so he would be ready. Funny kid! We are anxiously planning another trip to Disneyland. It's almost all that is talked about around here! Josiah ordered this book from Amazon. It's called The Disneyland Encyclopedia: The Unofficial, Unauthorized, and Unprecedented History of Every Land, Attraction, Restaurant, Shop, and Event in the Original Magic Kingdom. He's spent a lot of time over the past few days reading every detail. We are planning/hoping to go the 3rd week in February. Hopefully it works out. Hey, I just got finished learning about Molluscum contagiosum! That's one of the pox viruses! Funny how little boys are so excited to wear their cub uniforms, and then in a few years it becomes a weekly fight. So sorry about the miscarriage. Sorry to hear about your miscarriage. Hope the cramping goes away soon. My oldest had Molluscum contagiosum when she was about 3 or 4, on her forehead and the tops of her shoulders. Dr. said to put a tip of a toothpick into compound W, and then put the tiniest little bit onto one of the bumps. Did that for a few days and once one was treated they all disappeared. I think I caught that Molluscum contagiosum also. I've been scratching my legs a lot lately. This could be the end of me. 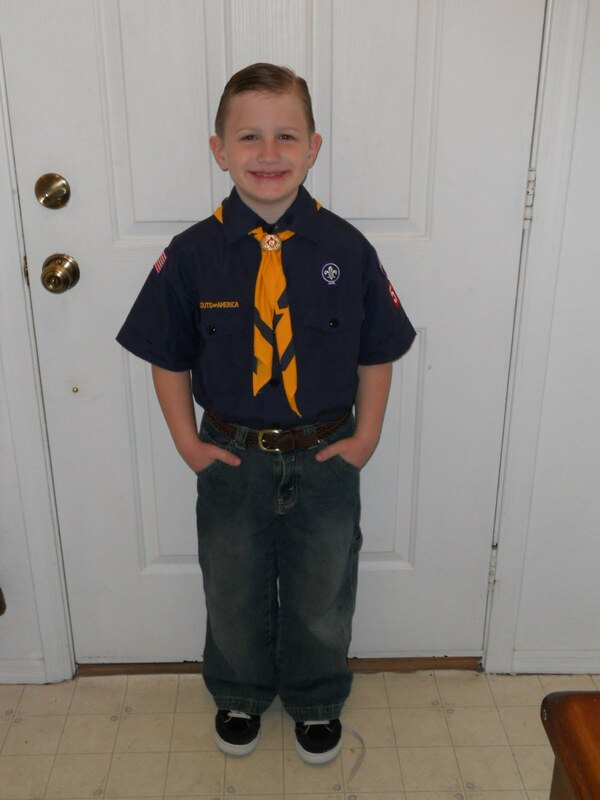 Camden looks great in his cub scout uniform! Tell him I was a Cub Scout, too, 50 years ago or so. Half century. O my gosh. I am glad that I had Jacobs Molluscums treated by a dermatologist, and I still highly recommend it. Jacob's were spreading rapidly. Even though each one only lasts up to a few months, they could keep spreading all over his body for up to 6 years and then you have to worry about him spreading it to others. I am so jealous! I cant wait til I can take my family to Disneyland. Hope you guys have fun! And again, sorry about the miscarriage. It's such a crappy feeling (and crampy) and I hope you can heal quickly. I've never heard of Molluscum contagiosum! You'd think with 9 kids, someone would have had just about everything. Looking forward to hearing about the upcoming Disneyland trip!